"...they had just witnessed a large military force capture an object which a lot of people would call a UFO. He added that 'this realization came as quite a shock to us all.' He and a majority of the others felt it was too alien to be man-made." To be more computer-friendly, the reprint has been divided into parts. Here begins Part 7 of Status Report III, written in June 1982. The series of status reports, I through VII, were written by Leonard H. Stringfield from 1978 to 1994. Previous Status Report IV begins at Earthfiles 021205. Leonard Stringfield died on December 18, 1994. 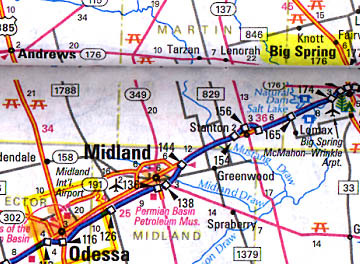 Big Spring, Texas northeast of Midland, allegedly 50 miles from secret Army Intelligence training base and 16 acre Air Force 'facility' in 1968. Previous PostPrevious Spirit Rover Finds Magnesium Sulfate Near “Larry’s Lookout” in Columbia Hills on Mars. Next PostNext U. N. Reports Earth’s Ecosystem Deteriorating Rapidly – Will Humans Change Bleak Future?